All cultural organisations are experts in audience engagement – it’s an essential part of what we do. 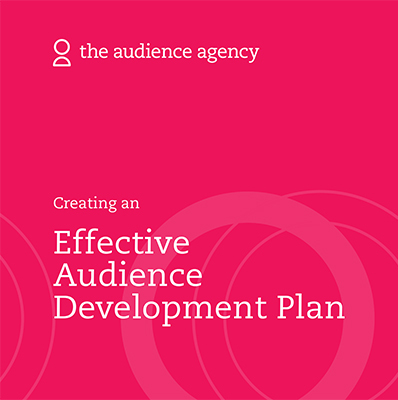 But an audience development plan is more than just an expression of how we do it. It is a forward-looking statement of intent and key to delivering public purpose, to staying relevant and resilient. The plan – and importantly the process by which we arrive at it – is a route-map for change, for growing audiences, increasing reach, building deeper relationships and doing those things to the best of our abilities, resources and the combined effort of our colleagues and stakeholders. The Audience Agency exists to give people better access to culture and we hope to support cultural organisations to become more democratic and inclusive. We think that having an explicit plan is a major step in that direction. It is important to say that there is no single, right way to create an audience plan. Every organisation is trying to reach different audiences for different reasons and in different ways and your plan should reflect the scale, resources, personality and purpose of your organisation. The approach outlined in this guidance is in no sense then prescriptive – simply a suggested route through the important considerations. The guide is presented in a linear way, but in reality developing a useful strategy is likely to be a dynamic and messy process, involving much toing and fro-ing, experimentation and adjustment. We urge you to devise an engaging and flexible planning process in which your whole organisation can be meaningfully involved. The suggestions here reflect the views and experience of The Audience Agency team and are based on a combination of documented theory. This guide is a simplified overview of our work supporting organisations to develop thriving audiences.